Figure 17.23. Fragmentation of the medial coronoid process. 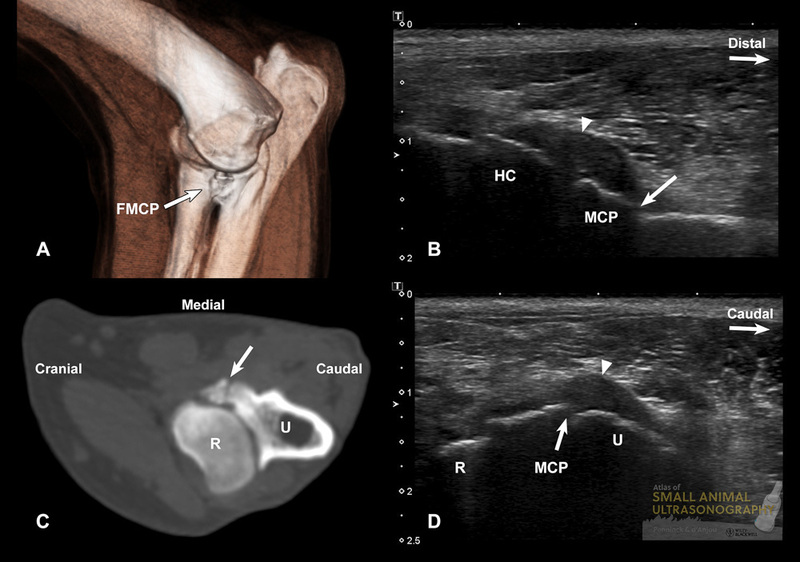 A: Medial view of the elbow of a 12 month-old Labrador retriever dog produced with computed tomographic (CT) volume-rendering, on which the fragmentation of the medial coronoid process (FMCP) is well visualized. B: This longitudinal sonographic image was obtained with the probe placed medially on the joint, the marker oriented proximally. The joint capsule is distended and thickened (arrowhead) and a gap (arrow) is present at the distal aspect of the medial coronoid process (MCP). The humeral condyle (HC) is mildly irregular. C and D: Corresponding transverse CT (C) and sonographic (D) images in which a fissure (arrows) extends through the MCP. The joint capsule is distended (arrowhead). R, radial head. U, ulna.